Nothing. Well, almost nothing. 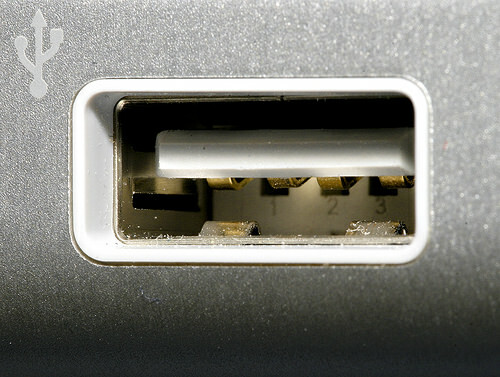 Every DIRECTV receiver has at least one USB port, and many of them have two! With all these USB ports, you’d think they would be good for something, right? You’d think you could hook up an external hard drive, a keyboard, something, right? In the past it was possible to connect an antenna module to your DVR to get over-the-air antenna channels in the guide. Today you can’t even do that unless you find an old used one on eBay. So why all the USB? Some have suggested that DIRECTV uses these ports for testing the hardware before it is released, and since new hardware would require new testing, the ports stay on the finished devices. Still others have suggested that the ports are inexpensive and the chips to run them are used for other tasks, it’s a “why not” situation. There are those who hold out hope that DIRECTV is testing USB hard drive support, or perhaps some sort of adapter for advanced features. One imagines a secret DIRECTV lab on the sixth floor of some unmarked building actively testing these features, perhaps testing DIRECTV-approved flash drives or hard drives, or even more excitingly USB keyboards or mice to make searching easier. Maybe… but if such a “skunk works” exists then regular mortals aren’t allowed in… and even if they were they could not report on in publicly, right? So in the meantime, the USB port remains next to useless. It makes a good charging port for your cell phone (but not for your tablet, which requires a 10V connection to charge.) If your hardware is in an enclosed space, a USB-powered fan can help dissipate heat, although it’s not really needed. For now, it’s more interesting to dream and guess about the USB ports, rather than facing the fact that they really… don’t… do… much. How do you change what programs show up in the playlist (DIRECTV Genie GUI)? Can you use a DIRECTV SD receiver with an HD dish? Can you replace the hard drive on a DIRECTV receiver?